The Milky Way rises over Kissimmee Prairie Preserve State Park in Florida, US. Photo by Judd Patterson. Dark skies have rapidly vanished in the eastern United States, leaving very few locations relatively untouched by the effects of artificial light at night. The need to identify and preserve these places is increasingly important for everyone dependent on the natural nighttime environment, from wildlife to stargazers. IDA has recognized the first such protected dark location in the U.S. state of Florida. Today, we announce the designation of Kissimmee Prairie Preserve State Park as an International Dark Sky Park. A public ceremony will be held at the park on Saturday, Feb. 6, 2016, to celebrate the park’s achievement. Located away from the major population centers of central and south Florida, Kissimmee Prairie is a prime destination for people who want to get away from the stresses of everyday life. 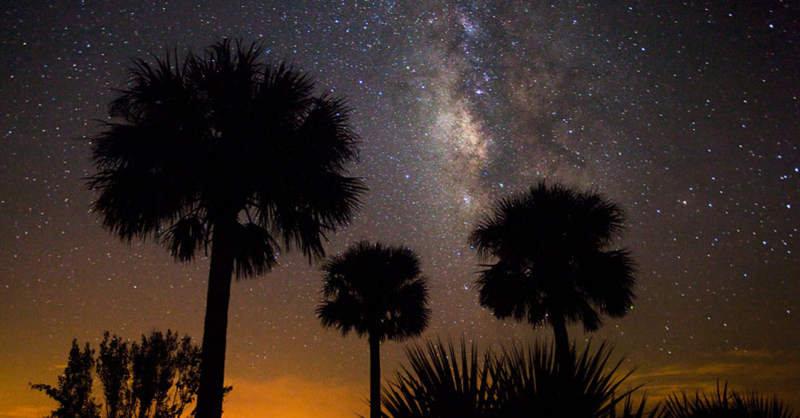 The night sky over Kissimmee Prairie Preserve State Park is both a cultural and natural resource, and its quality is among highest in the peninsula of Florida. Stargazers from around the state flock to the park to appreciate the splendor of its natural darkness. Kissimmee Prairie Preserve State Park is the first Florida state park to build an astronomy pad dedicated to observing the night sky. The Florida Park Service strives to preserve and maintain native Florida landscape for generations to come. This park provides a place where visitors can come to connect with the stars. More information about the park can be found at www.FloridaStateParks.org.